Banana and plantain are important food and cash crop in Cameroon. Banana bunchy top disease (BBTD) is a serious threat to Musa spp production and the most economical important viral disease of banana and plantain worldwide. The disease is caused by Banana bunchy top virus (BBTV, genus Babuvirus). In Cameroon, BBTD was first reported in 2008 (Oben et al., 2009); at that time, BBTD was confined in an area (Kou’ou-si, Abang Minko’o to Mengama) within Vallée du Ntem Division- South Region closer to Gabon and Equatorial Guinea. BBTV isolates from Cameroon is closely related to Gabon isolates which clustered within the South Pacific group (Kumar et al., 2011). BBTD is spreading into unaffected areas, most likely by mean of infected planting materials as consequence of human movement, making the disease an emerging threat. A total of 175 fields were surveyed and BBTD were detected in 8 fields all situated in Vallee du Ntem Division. BBTV was detected in 3% of the 972 samples tested. As such in Cameroon, BBTD is restricted in South Region, in Vallée du Ntem Division bordering Gabon and Equatorial Guinea (Fig 1). Within the Division, BBTD is spreading into new localities Ambam and Mekoe about 30 Km from its initial focus. In addition to the current control measures, strict quarantine laws on seed exchanges between areas should be implemented within the country to avoid transfer of infected planting materials from infected to uninfected areas hence contributing to stop the progression of BBTD in Cameroon. Kumar, P.L., Hanna, R., Alabi, O.J., Soko, M.M., Oben, T.T., Vangu, G.H.P. & Naidu, R.A. 2011. Banana bunchy top virus in sub-Saharan Africa: investigations on virus distribution and diversity. Virus Research 159: 171–182. Oben, T.T., Hanna, R., Ngeve, J., Alabi, O.J., Naidu, R.A., Kumar, P.L., 2009. 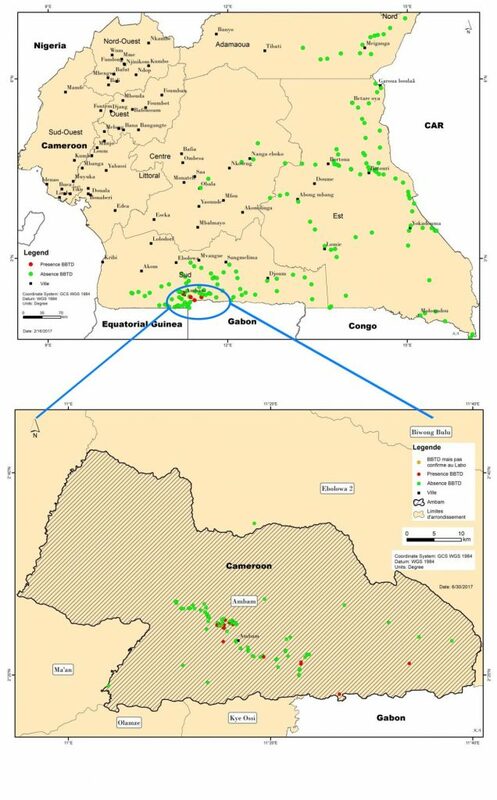 Occurrence of Banana bunchy top virus in Cameroon. Plant Dis. 93, 1076.